4 year old border collie. 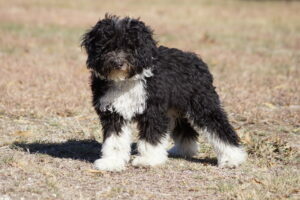 Luke is well bred from many generations of top competitors, champions and health tested border collies. Both his parents are AKC champions. 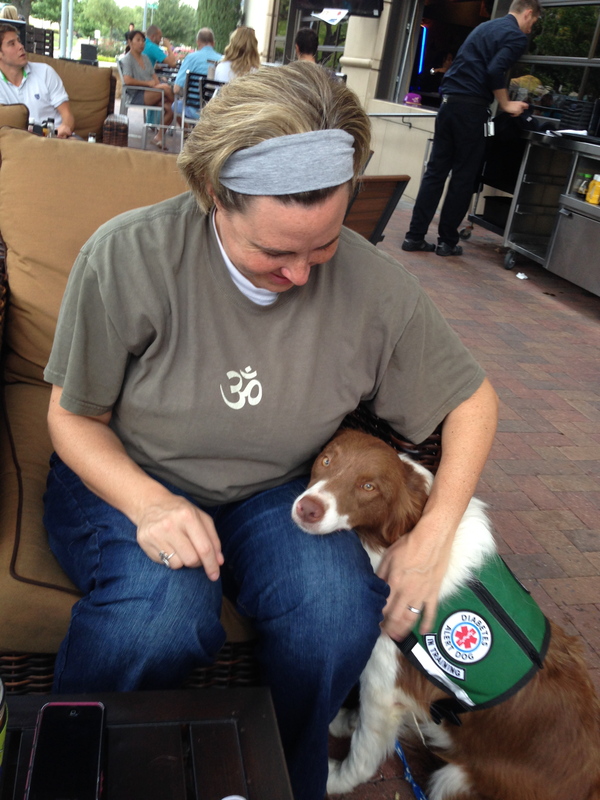 Luke comes from a long line of some of the worlds most well known Border Collies who excel at many sports and many who are also working service dogs. 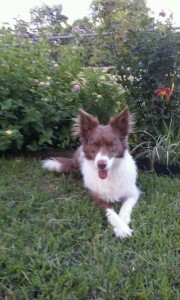 He was co-bred by Red-Dawn near Dallas and Bokate Border Collies in Texas. Luke would do best in a home who understands how smart dog breeds think. He’s incredibly smart, has a strong prey drive and needs a structured life. He’s not a dog for an amateur dog owner. Bryce is a 3 year old Bordoodle. He weighs 35 lbs and has a non-shed straight fleece coat. 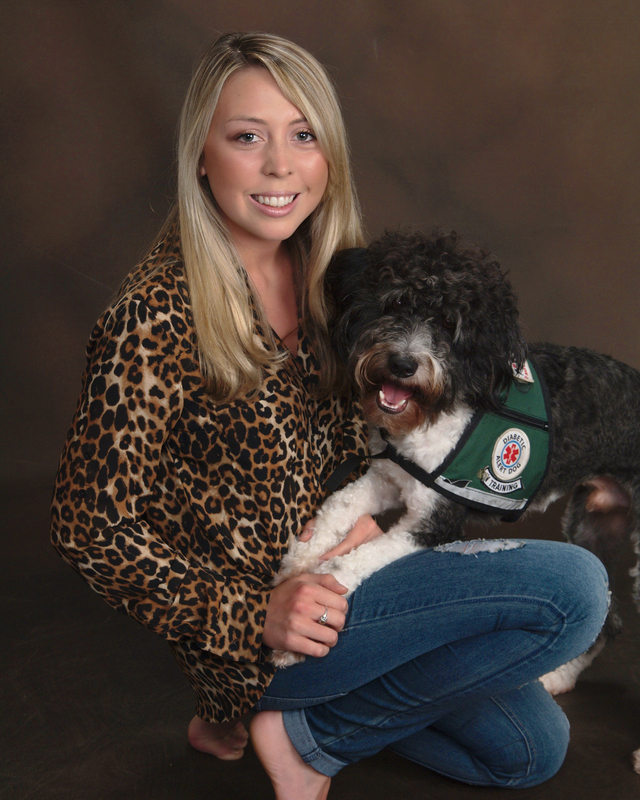 Bryce was bred by us, Safari Doodles, and is related to many service dogs including diabetes alert dogs and PTSD service dogs. He has multiple siblings who are trained and placed as service dogs through AGS / Aggie Guide Dogs and Service Dogs in Texas; Power Paws Service Dogs in Arizona; and Brooks Labradors in Texas. Bryce is a happy dog who loves all people. He does great with dogs, cats, kids and all people. He is fully house trained and has great house manners. 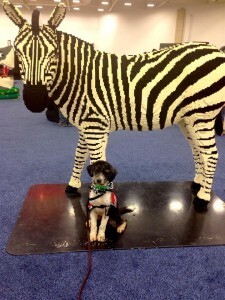 Bryce has been in intensive training since he was 8 weeks old in obedience, public access and scent detection. He will alert his trainer when he smells a high or low sugar sample. We have months of documentation of Bryce alerting a Type 1 Diabetic when the person’s blood sugar was out of normal range. Bryce is good with all people but needs a home with a person who enjoys a very smart active dog. He has a special love for kids and would be an exceptional partner for a child. Ariel is an F1 Labradoodle. She has a moderate shed coat. Ariel is the mother and grandmother to dozens of service dogs and therapy dogs. Many of her puppies are working service dogs. Ariel has the most fantastic temperament. She is bomb proof and is great in all situations. She is fully obedience trained, fully house trained and has great house manners. She has spent 1 year of her life training for public access and scent detection. 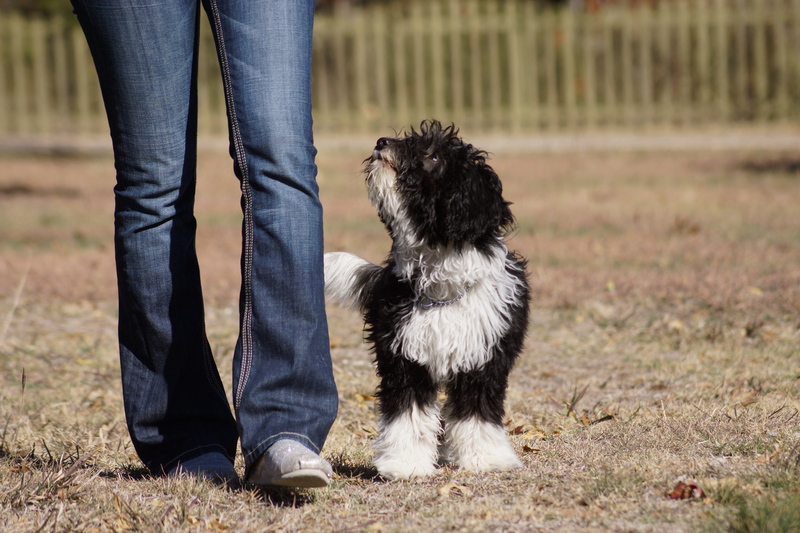 She will alert her trainer when she smells a high or low sugar sample. 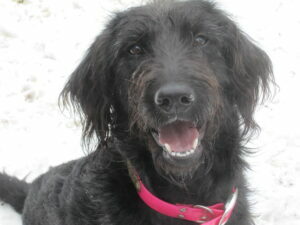 Ariel would be good in any home and with any skill level of owner. Enndo is a 3 yr old mini Bordoodle. He weighs 28 lbs and has a non-shed straight fleece coat. 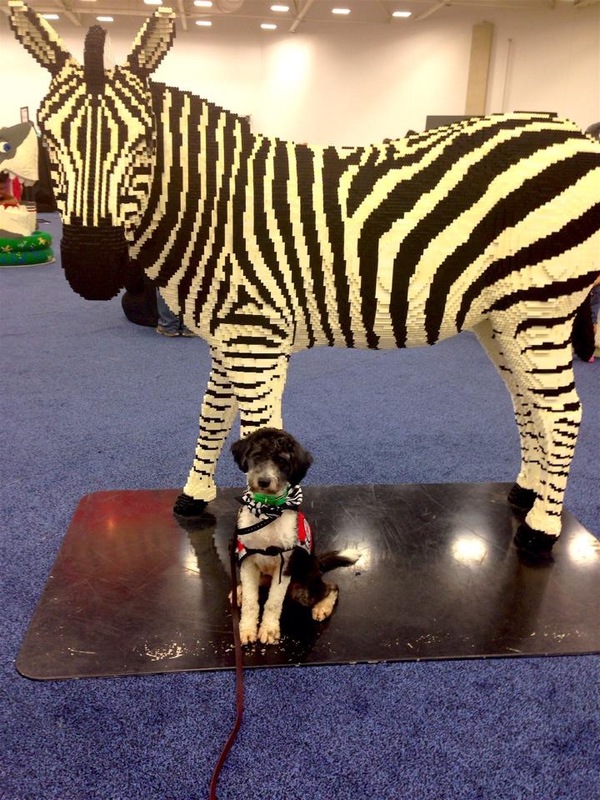 Enndo was bred by us, Safari Doodles, and is related to many service dogs including diabetes alert dogs and PTSD service dogs. 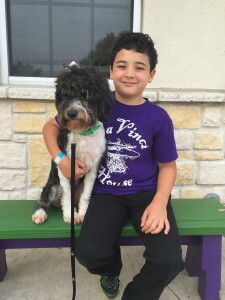 He has multiple siblings who are trained and placed as service dogs through AGS / Aggie Guide Dogs and Service Dogs in Texas; Power Paws Service Dogs in Arizona; and Brooks Labradors in Texas. Enndo is a happy dog who loves all people. He does great with dogs, cats, kids and all people. He is fully house trained and has great house manners. 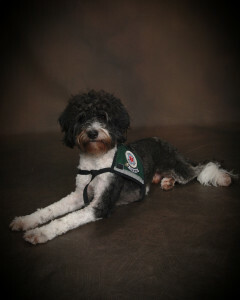 Enndo has been in training since he was 8 weeks old in obedience, public access and scent detection. He will alert his trainer when he smells a high or low sugar sample. We have weeks of documentation of Enndo alerting a Type 1 Diabetic when the person’s blood sugar was out of normal range. Enndo is good with all people but needs a home with a person who enjoys a very smart active dog. We are located north of Dallas Texas. Please contact us for more info on our trained dogs.